Things of late haven't been so great, but I'm hanging in. First, an update on dad. He's not doing well. The cancer has progressed very rapidly, from his pancreas to his liver, lungs, stomach, lymph nodes and surrounding blood vessels. While he's started chemo treatments, his considering stopping already since the treatments are making him feel ten times worse and at best will only give him another couple of months - and it's only going to get worse with each treatment. He wasn't doing well BEFORE the treatments, he had to spend 10 days in hospital to get his digestive system working so they could build him up for treatments, and they were still very skeptical as to whether they would even attempt it. We're all behind him no matter what he decides. He's lost a lot of weight - if he still weighs more than me I'd be surprised. He's constantly battling with dehydration and is on IV off and on. He has a nurse that comes in for a little while each day to keep an eye on things, and home visits from a doctor each week to monitor his condition. He's also got an IV pump for his dilaudid, it's a steady drip, but he can self dose if needed. It's gotten to the point now where he can't be left alone, in case he has trouble getting up for the bathroom or anything like that. Where he used to have good days and bad, now he has good and bad hours and the bad far outweigh the good. It's now been 2 months since he was diagnosed. His list of meds is incredible, we had to make up a spreadsheet to keep track of them all and when he has to take each one. His diabetes is awful at this point, however the doctors don't really care what he eats at this point, anything that stays down is good and we just dose him with insulin rather than worry about what's making his blood sugar skyrocket. Most of the time he's in pretty good spirits and trying to joke around, but I can see how much of a toll it's taking. How am I taking it all? Well I'm okay when I'm actually WITH dad. I can control my emotions and not lose it in front of him. It's when I'm not with him that I struggle the most. I cry a lot, though I suppose that's to be expected. I feel like I have a cold, ALL the time, likely from the crying. I'm also pretty dehydrated, no matter how much water I drink, again likely from the crying and blowing my nose all the time. When I sleep, it's fitful, full of nightmares. Most of the time, I don't really sleep, I just lay there for hours and drift in and out, or eventually just give up and read. About the only time I seem to be able to actually fall asleep easily is on the couch with the TV on. The doctor mentioned anti depressants, but those have never worked for me. Since this depression is simply from the situation, I doubt they'd be of much use now either, plus I don't like taking meds unless absolutely necessary. Venting helps sometimes. Punching things helps. Screaming helps. I can't help it. I'm daddy's little girl and while I know I'm being childish and selfish, I don't know how I'll make it without him. I can see him growing weaker, day by day, and I know we don't have much time left. I haven't been to work in nearly a month. I just can't face it. Being at home or around family is one thing, they expect me to lose it so I don't feel silly about doing it. At work, I can't concentrate, I spend half my day in tears, and I can't be distracted like that serving customers and especially working with knives and slicers and band saws. Add to that there are a couple of people I work with who are constantly asking me if I'm okay - which of course sets me off. Between that and running back and forth to spend time with dad and help mom, it's just too hard. So far they've been understanding, but I don't know how long that will last. First opportunity I get I will go in and sit down and talk to the boss and explain in detail. They're pretty good that way. If they don't have a problem with it, I'll just take a leave of absence until this is all over. If they do, well I can find a part time job somewhere else. There are lots of jobs out there, I've only got one dad. Oh, and with all of this going on, everyone has started remodeling my parents' house. It started out as a small project - the upstairs bathroom. My grandmother (dad's mom) had a bit of a hissy because she couldn't come down and stay at mom and dad's because the bathroom upstairs wasn't finished (dad started it a few months ago, but when he started getting more and more ill, it got pushed aside) and she couldn't be expected at her age to trudge up and down the stairs to use the bathroom at night. Plus, all the materials for the bathroom were stored in the spare bedroom, so that wasn't exactly up to her standards either. So we made plans to attack the bathroom and get it done this week, mostly so she'd stop bitching about it. We didn't tell her about it, since dad is supposed to limit his visits right now because the chemo makes him susceptible to illness - and everyone who was helping out knew to keep their distance. She found out that my aunt and uncle were coming down and freaked out because my aunt wouldn't bring her. When my aunt explained all this to her - that the upstairs would be all torn apart so there wasn't anywhere for her to sleep, and the bathroom would take a few days to finish off so she'd STILL have to use the one downstairs, and dad wasn't supposed to have everyone around - did she understand? Of course not. She immediately called dad - who knew nothing about our plans mind you - and screamed at HIM about everything - including telling him he was out of her will because he didn't love her enough. Nice thing to say to someone who's maybe got a month or two left. I've never in my life seen him that upset. To say I'm furious with my grandmother is an understatement. I'm not exactly fond of her to begin with, but this was just beyond reason. If you've ever watched the Sopranos, think of Tony's mother and you'll get a pretty good idea of what my grandmother is like. No matter what, it's ALL ABOUT HER. It's all I can do not to phone her and just let loose on her, but I promised my mother I wouldn't for my dad's sake, so I haven't. Mom, on the other hand, did call her and let her have it. And what did my grandmother do? Denied she'd even called. Anyway, back to the remodeling - after my uncle started working on the bathroom, he decided that while he was at it, he might as well fix up the drywall in mom's room too. And the spare room. And now he wants to do dad's room too. This involved getting paint and materials for them all, moving furniture around everywhere... We did get a bunch of stuff done, and the bathroom IS finished. Mom's room is pretty much finished, it just needs to either have the hardwood floor refinished or an area run or carpet laid. The spare room isn't even remotely done, nor is dad's room, since they became storage for all the furniture. So there is tons left to do. I think we'll leave he rest for later. After all is said and done, it's unlikely mom will keep the house, it's far too big just for her. So we'll finish it all up for cosmetic purposes to help it sell. On top of all of this, mom is trying to get my grandmother's (her mother's) house on the market. Long story short, my grandmother died nearly 3 years ago, and left the house to my mom, my aunt and my uncle. However my uncle has been living there and refusing to allow them to sell it, and for the past year refuses to answer the phone or emails. Last time dad showed up, in July, they nearly got in a fistfight over it. Mom finally took him to court - he didn't even show up - and the judge gave him 30 days to vacate or he'd be evicted - which is up next week. So there's a lot of back and forth for her to the lawyers as well. I just pray he doesn't do anything stupid and trash the house before he leaves. I know there are a few things that need fixing up, but all in all the house WAS in good shape last time I was there. Once he does vacate, there is still a bunch to do to get the house ready to sell, and normally we wouldn't rush, but mom wants to retire. She pretty much has, but money is VERY tight until she can get it sold and pay off a bunch of bills, her savings and pensions will cover the normal stuff, but not all of it. There's just so much up in the air right now. Nate has been off and on. He's not a mess like me that I've seen, but I know he's terrified. He's grandpa's boy. My dad's nickname is Rocket, Nate has always been Little Rocket. He's busy with work, and I know that helps. I know he's upset because he can't visit as much as he wants to, but sometimes I think that might be for the best. Every time he does see dad, it's a bit of a shock for him. We try to get him down at least every couple of weeks, even if it's just for a night. 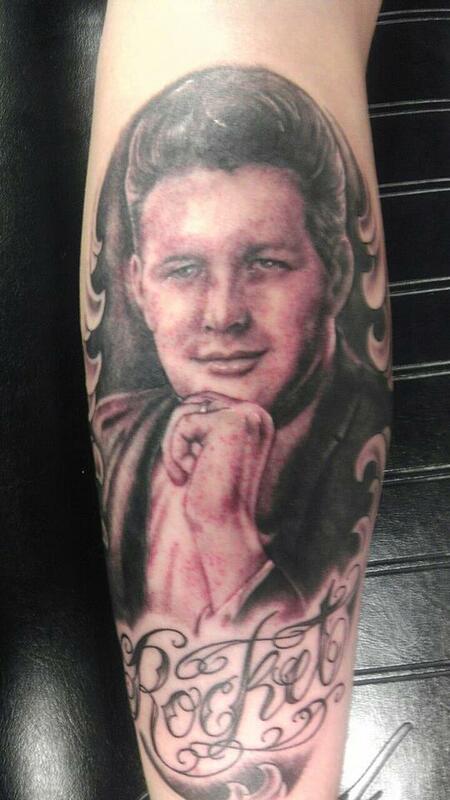 He had my dad's face tattooed on his leg a few weeks ago, because he wants to keep dad with him always. Dad didn't get it at first, just wondered why Nate would want to do that until mom explained it to him - then he got all choked up. He chose a picture from my parents' wedding day, and it looks incredible. Jon has been great. He holds me when I need to be held, spends time with me when I don't want to be alone, listens to all my ranting and venting. He takes care of all the household stuff so it's one less thing for me to worry about. He tries to keep me laughing as much as he can. He's much like dad that way, and I'm understanding more and more why I chose him to be with. The other thing keeping me from a nervous breakdown is stitching. I've been stitching "just for fun" projects and it does have a very calming influence. I'm currently working on - and getting close to finishing - Lavender and Lace's Angel of Winter. I don't have an up to date picture to post, but I'm doing her on 40ct fabric instead of the called for 32ct, and using Silkweaver's Poltergeist, which is a grey with mauve and blue undertones. I'm using petite beads instead of the regular seed beads and they fit pretty well. I may have to do a tiny bit of fudging in a couple spots, but I don't think it will be too bad. I also decided to try out Sullivan's floss for this one and I really like it. I'm finding it covers a lot better than DMC and doesn't knot or tangle as much. The colours aren't exactly the same as DMC, but they're pretty darn close. When I finish it up, I must remember to take a picture! Holy crap I wrote quite a novel. Just needed to let it out, I guess. I am very sorry about your Dad, Nicole. My thoughts are with you and your family. It is good that you have your family close to you and can by comforted by them. I am glad that you can find comfort in your stitching. Be well and take care. I am so glad we can be here for you during this time. Sometimes just venting helps relieve the pressure. As a Daddy's girl myself I know how difficult this is for you. We are here for you whenever you need us. Good on you for letting it out. It's especially difficult when you are so close. I'm pleased the stitching helps, and that you have people close to you. All the best. You'll get through.